Why do Russians always drink tea (often with lemon)? No matter if you are a tsar or just an ordinary Russian person - most certainly you drink tea. Forget about vodka. The world's largest country is also the greatest tea-drinking empire. “All Russians drink vodka, and if I’m invited to someone's home I’ll certainly try some,” a foreigner might think, relying on the usual stereotypes. What you certainly WILL be offered is tea. You don’t even need to go to Russia – Russians order tea in a restaurant or café whatever the time or the country they are in. “Tea is sacred for Russians,” you might think. Indeed, Russians love tea and always drink it. According to a 2014 poll, 94 percent of Russians drink tea. Famous author Leo Tolstoy used to say: “I needed to drink much tea for I can’t work without it. Tea awakens those opportunities that dream deep inside my soul.” And no vodka at all. Unlike Napoleon or Hitler, tea successfully ‘invaded’ Russia and conquered the country for good. As with most other countries, tea was originally imported from China, but when exactly? Historians still argue about that. The 19th-century scholar, Dmitry Prozorovsky, wrote that Russia’s envoy to China in 1654 had mentioned it as “a common thing,” adding that, “Tea is one of the main necessities for a modern-day person.” That's certainly a very Russian attitude. “By the middle of the 19th century, all social strata, from nobles to the poorest peasants, were drinking tea,” historian Alexey Volynets wrote in an article for Russian Planet. Even Nicholas I, Russia’s severe tsar from 1825 to 1855, ordered to serve imprisoned revolutionaries “with tea,” because not doing so would be inhumane. With tea quite cheap, everyone could afford it. But the tea that the aristocracy and rich merchants drank surely was different in terms of quality. 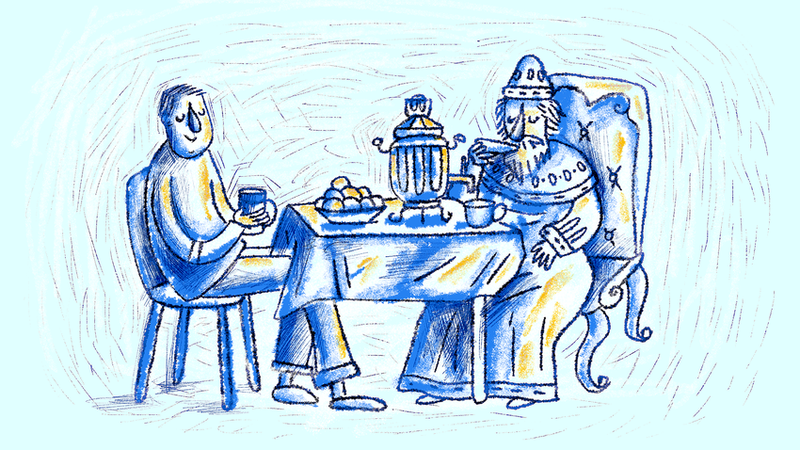 In short, drinking tea became a Russian tradition uniting people of all backgrounds. In 2016, research conducted by Euromonitor International showed that 78 percent of Russians chose tea in a binary “tea-or-coffee” contest. (In the U.S. the 'coffee party' won with 75 percent; no wonder the two countries often misunderstand each other). Vladimir Lenin, the architect of the October Revolution in 1917, also enjoyed tea. Many memoirs by revolutionaries of that period begin with Lenin drinking tea with his comrades. “During his time in exile abroad, as well as after it, he drank beer or wine from time to time, but never was a fan,” Sovsekretno.ru wrote. Stalin wasn’t the only one to enjoy lemon in his tea, and this habit is specifically Russian. In addition, in a cold country such as Russia, it's important to have foods with vitamin C. Not all Russians, however, prefer tea with lemon. Some like it the English way, with milk; but many also drink plain tea. In the end, there’s no such thing as ‘bad tea’ for a Russian. And here is an article on how to drink tea the true Russian style. Enjoy!